What’s the story: Thirty years after the events of Return of the Jedi, the new and dangerous First Order threatens to enslave the galaxy. The Resistance, headed by General Leia, lead the counter charge. Thrown into the fight are Stormtrooper deserter Finn and scavenger Rey. What’s the verdict: From the opening story crawl we know balance has returned to the Force. Gone are trade negotiations and taxation, replaced with good vs evil, heroes and villains and the promise of thrilling adventure that made the original trilogy so beloved. J.J. Abrams and co-screenwriters Lawrence (The Empire Strikes Back) Kasdan and Michael (Toy Story 3) Arndt know they’re on a mission to rescue a franchise. And from the beginning The Force Awakens delivers a part continuation of the saga, part reboot of the Episode IV: A New Hope. Familiar story beats pepper the plot. New droid BB-8 holds vital information that could tip the upcoming conflict for either the Resistance or the First Order. Said droid winds up on a desert planet, here Jakku. A daring rescue of a beautiful heroine occurs. A deadly super-weapon, located in the fan-friendly named Starkiller Base, threatens disaster for the galaxy. And fear not, there is a rough n’ ready cantina bar and yes, it does have a house band. Stamping out a sense of deja-vu are new characters as rich as Han, Luke and Leia. Plus, a story of burgeoning adulthood and different roads taken that should have been the plot of Episode I.
John Boyega confidently walks a hero’s path as Finn, the Stormtrooper runaway appalled at the atrocities of The First Order. Matching him is Daisy Ridley as Rey, a junk scavenger, brimming with optimism, good with electronics, handy in a fight and basically Han, Luke and Leia rolled into one. Adam Driver has the most difficult task as The Force Awakens’ big bad Kylo Ren. Yet, with smirking contempt, frightening flashes of temper and casual cruelty, the unusually handsome Driver delivers the best villain since Darth Vader and has a lot more Dark Side to explore. But, the tear-jerking spine shiver is saved for Han Solo and Chewbacca’s entrance, Harrison Ford (and a hidden Peter Mayhew) slipping back into their characters and conveying thirty years of adventure through banter and affection. Although Oscar Isaac’s as ace pilot Poe Dameron’s gives everyone a run for their money in the “I want to be Han” stakes. And Mark Hamill’s Luke? That would be telling. The best directed Star Wars movie since Empire, Abrams delights in bringing his cinematic bravado to Lucas’ fertile universe. Assured in his juggling of the light and dark plot threads before they converge, Abrams lets bold visuals and John Williams’ score do much of the talking. The desert landscapes of Tatooine, the ice world of Hoth and the lush forests of Endor (or Naboo) are all invoked here through new planets. TIE-fighters howl and swoop with terrifying grace of Coppola’s choppers in Apocalypse Now. A dogfight with the Millennium Falcon and said TIE-fighters captures the excitement and magic of the originals in a way the prequels never did. GoPro style X-Wing shots diving toward Starkiller Base put the heart in the mouth where it stays for the final twenty minutes. And when the Force truly awakens, in the snowy woods of the First Order’s weaponised planet, the atmosphere is electric. 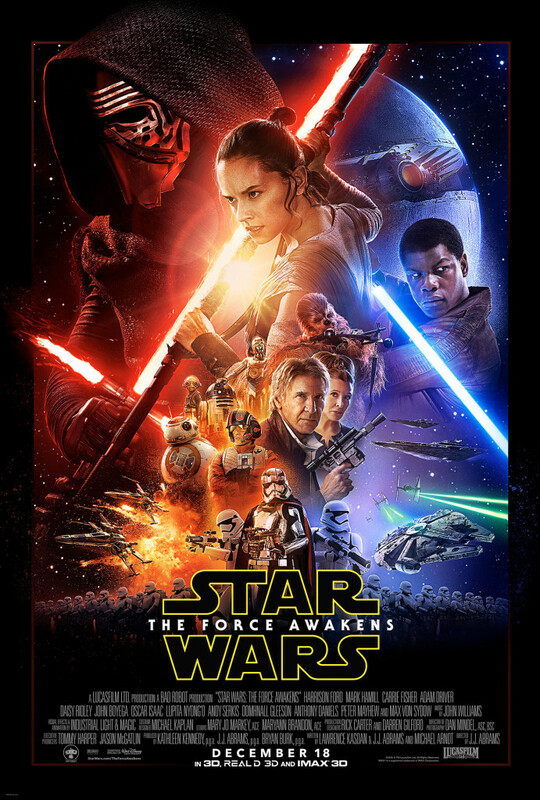 This is also the first Star Wars made in the wake of movies created by filmmakers the original trilogy inspired. There is an echo of Peter Jackson’s The Lord of the Rings in the final moments. Moments of banter and action recall Joss Whedon’s Serenity, the greatest Star Wars movie never made. While the revitalised energy matches Abrams’ own Star Trek do-over. Elsewhere Rey’s scavenge through the downed Star Destroyer calls to mind the opening of Hayao Miyazaki’s animated masterpiece Nausicaa of the Valley of the Wind. Fitting, as fellow Japanese director Akira Kurosawa’s The Hidden Fortress inspired Lucas when writing the original movie. Not all is perfect. Emperor Palpatine replacement Supreme Leader Snoke (Andy Serkis via mo-cap) is under-developed. The climax is reminiscent of A New Hope and Return of the Jedi and The Phantom Menace (wryly acknowledged in the dialogue). And there is a big emotional beat that may not be earned – only the sequels will tell. 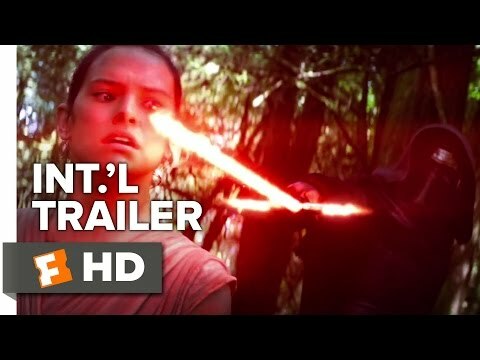 But, this is better than we could have hoped for, and as the trailers carefully kept plot details hidden, the cliffhanger climax provides only tantalising clues to what Episode VIII will deliver. At least we have Rogue One to keep us going until then. And re-watches of this hugely enjoyable movie.